Topic: Seattle Lindy Exchange 2010! Aug 13-15! travis, was it the lyrics that gave it away, or are you just that good? Topic: Worst Songs Ever Heard at a Lindy Hop Night? Bria is great, and most of what she does for swing dances is fun and energetic...not worthy of this thread I'd say, unlike her Buble-esque tracks. Her album "Fresh" and it's relation to Buble, however, are not all that indicative of her dance bands, thankfully, as seen in those links Dave posted. 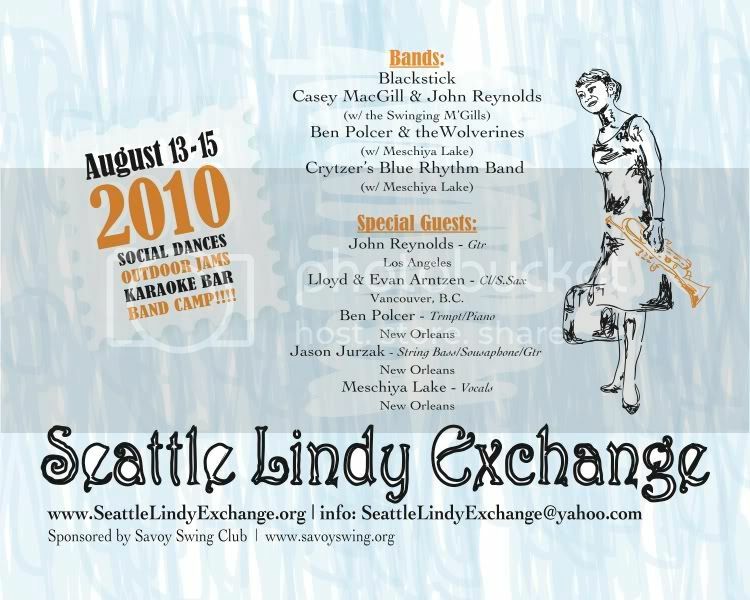 Topic: Seattle Lindy Exchange 2009 - 10 YEAR ANNIVERSARY!!! I've found that the New Orleans Jazz Vipers have a few tracks that can get some of the crowd you seem to be describing. Try out their version of "Zonky" for a high energy faster tune. They'll never know it's a cover of an old 1920's tune. Topic: ellington "it ain't what you do"? all he did was state an opinion about mid-tempo shim shams? why get all bent out of shape? and besides, it led to the posting of a fun fast shim sham video with Frankie, so what's the real harm? A forum of only tacit agreement is boring. It's true, there are some dancers that don't like drum solos. There are also some dancers that don't like chocolate milk (poor souls). There are some old men that don't like swing music. There are some cats that have no tails.